For larger Utility/IPP systems, please click here. Canyon Hydro designs and manufactures small hydro systems ranging from 4kW to 25MW. Each system is designed and built at our manufacturing facilites in the USA. For our customers with residential or small community projects, Canyon Hydro provides a broad selection of micro-hydro systems up to about 100kW, each delivering high efficiency, quality and reliability at a reasonable cost. If you have requirements for larger systems, please refer to Canyon Hydro Utility/IPP Systems. This dual-jet system, located in Costa Rica, drives a 14kW generator, and uses a needle nozzle to allow adjustment for changing flow conditions without shutting the system down. The heart of a Canyon Hydro system is the water turbine. Efficiency counts most here, and we take great care to ensure maximum power transfer. Canyon Pelton runners are all-metal, cast as a single unit. 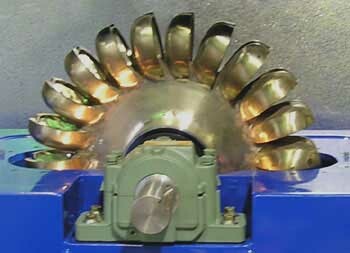 Bucket tip, splitter and exit angles maximize the transfer of hydraulic energy to the turbine shaft. Each bucket is hand-polished, with special attention directed to the rear of the bucket to minimize internal aerodynamic drag. Similar procedures are employed for Canyon Crossflow and Francis turbines, using the highest quality materials and advanced manufacturing techniques. Most importantly, Canyon turbines are backed by a group of experienced professionals who know hydro systems, and are dedicated to the success of your project. We strongly recommend that you let Canyon Hydro design the proper turbine system for your site, because the most efficient system involves many complex factors. There is no charge for this service. Canyon Hydro Manganese Bronze Pelton runner. Beginning with your measurements of HEAD and FLOW, Canyon experts will specify the right combination of turbine type, diameter, bucket or blade characteristics, nozzle sizing, shaft speed, housing dimensions, and more. We think it’s important that you get the most power possible for your investment. The most essential information we require is accurate HEAD and FLOW measurements. Eventually, we’ll also need information about your pipeline and electrical requirements, but we can assist you with defining them once we know your HEAD and FLOW. You can learn more about HEAD and FLOW, and how to measure it, in our Guide to Hydro Power. To get started, simply fill out our data sheet and send it to us. Canyon Hydro produces a wide array of turbine systems, making it possible to closely match your site characteristics for optimum efficiency. See the accompanying chart for performance specifications on five representative models.